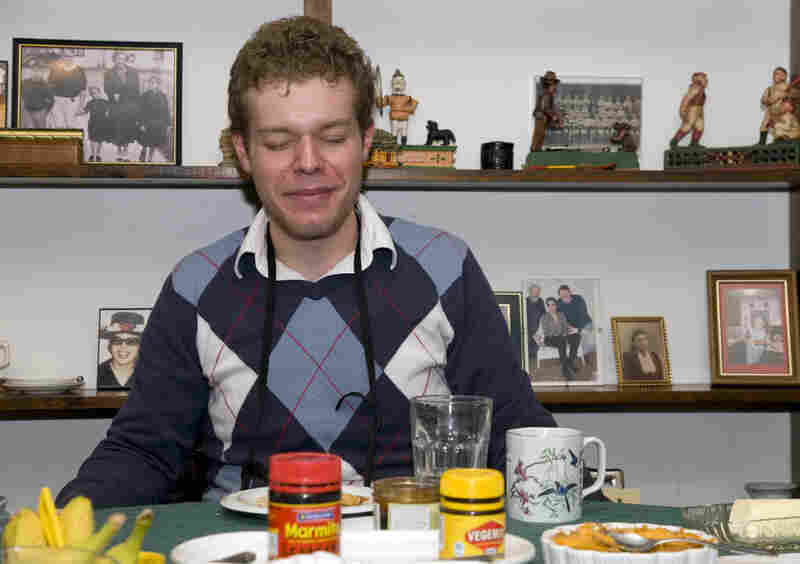 Marmite Spread Captures Hearts, Curdles Stomachs If you've heard of Marmite, you probably also have a pretty strong opinion on whether you like it or not. The British spread is thick, sticky and dark — almost black, like tar. And, some say, it's disgusting. Marmite, a viscous spread made from yeast extract, provokes strong reactions from fans and foes alike. Maggie Hall is a British native and the author of The Mish-Mash Dictionary of Marmite, An Anecdotal A-Z. 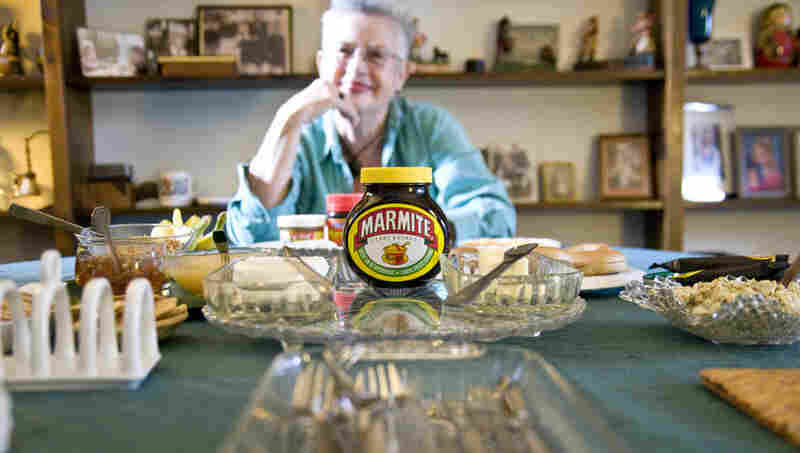 Here, she poses in her Washington home with an array of Marmite snacks. 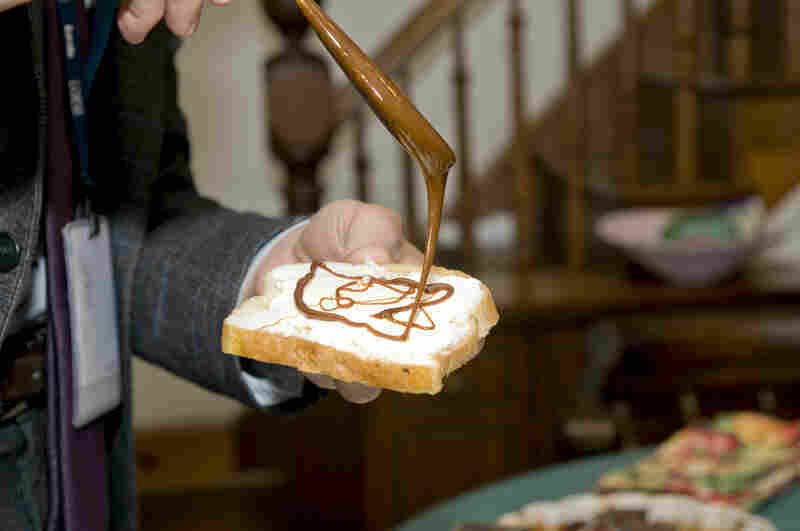 Weekend All Things Considered host Guy Raz drizzles Marmite on a piece of buttered white toast. Raz savors his Marmite toast. He developed a love for the spread while living in England and eats it frequently. Producer Travis Larchuk grimaces after his first taste of Marmite on toast. Marmite enthusiasts can now snack on Marmite-flavored cereal bars. 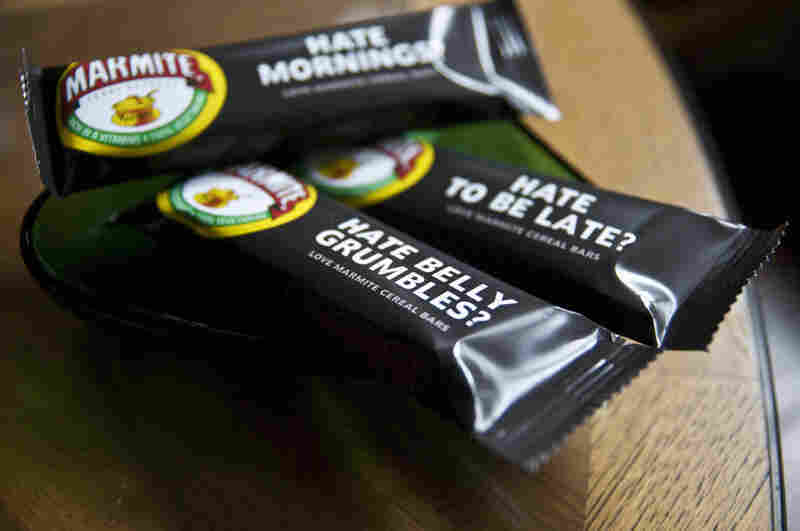 Unilever, the makers of Marmite, launched the breakfast treats this fall. Writer Bill Bryson once said, "There are certain things you have to be British to appreciate: skiffle music, saltshakers with a single hole, and Marmite — an edible yeast extract with the visual properties of an industrial lubricant. If you've heard of Marmite, you probably also have a pretty strong opinion on whether you like it or not. The product originated in the United Kingdom, and these days it's advertised with the slogan, "Love it or hate it." That's because Marmite has a very distinctive flavor. It's a byproduct of the beer-making process, made from the yeast extract left behind from the brewing process. The spread is thick, sticky and dark — almost black, like tar. And, some say, it's disgusting. But Maggie Hall disagrees. Marmite is her secret passion. The author of The Mish-Mash Dictionary of Marmite, Hall says the savory goo was another gift from milk safety hero Louis Pasteur, who paved the way for the stuff with his yeast research. Visit Hall's home for a Marmite feast, and she'll serve you Marmite cake, Marmite egg salad, and sausages cooked in Marmite. To some, like All Things Considered host Guy Raz, such a meal is a delight. But for the uninitiated, like producer Travis Larchuk, there's an entirely different reaction.